The PowerPro 5 is designed to provide high-torque, high-starting power for diesel engines up to 10 liters used in school buses. NOVI, Mich. — Prestolite Electric has introduced the PowerPro 5, a new 12V 5kW drop-in replacement school bus starter from Leece-Neville Heavy Duty Systems. 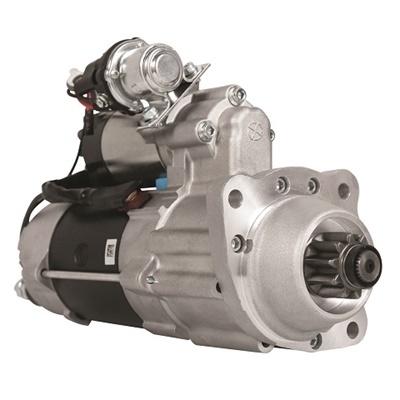 The latest addition to the PowerPro starters features a planetary gear reduction design to provide high-torque, high-starting power for diesel engines up to 10 liters used in school buses. Each PowerPro 5 starter includes an electrical soft-start relay that allows the pinion to engage the ring before cranking, as well as overcrank protection to shield the starter from high-temperature damage when starting the motor in extreme conditions. The PowerPro 5 weighs less than 29 pounds, and has an integral magnetic switch and a copper brush plate to improve performance and conductivity. For more information, email [email protected] or go to www.prestolite.com.